Let my hands be strong in doing your work, Father. Let my feet be strong as they follow you in the right path. Let my brain be strong as it makes you and your will my priorities, Abba. Let my heart be strong in its devotion to you. Let my ears be strong as they filter through the lies of my culture to understand and live out the truth of your word, Father. Let my lips be strong in pleasing you and speaking love to others. Let my eyes be strong as they focus on you, Abba. 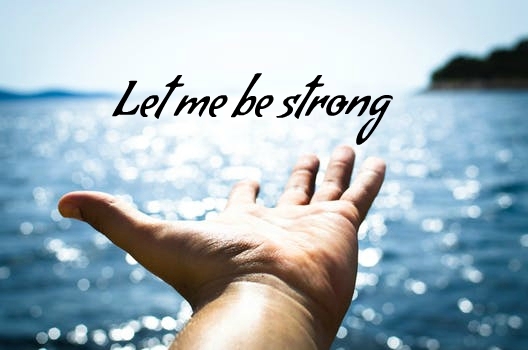 Let my legs be strong to carry me through this earthly place of sin and evil and pain. Let my arms be strong as I lift them toward heaven, stretching up as you reach down to touch me – to touch my life. Let my knees be strong as I kneel to thank you for your faithfulness and love, Father. Let my soul be strong, Abba, as I live confidently on your promises each day – every day – until the day you bring me home. Please keep me strong, Father. Amen! Let it be so, Father.